This form of therapy is used for relaxation of muscle spasms, increase of local blood circulation, muscle rehabilitation and re-education, maintaining and increasing range of motion and management of chronic pain and post-traumatic acute pain. 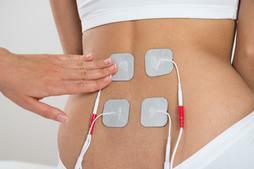 Interferential current therapy is beneficial in reducing pain and increasing circulation. The low volt impulses are generated and delivered through electrodes on the skin in direct proximity to the muscles to be stimulated. Therapeutic Ultrasound is a method of deep heat which stimulates tissue beneath the skin's surface using sound waves. It is a very high frequency massage that can penetrate up to 5" below the surface of your skin. Ultrasound therapy increases blood flow in the treated area which speeds the healing process, reduces swelling and edema which are the main sources of pain, and gently massage the muscles, tendons and/ or ligaments in the treated area. This enhances the recovery rate of damaged tissue without adding strain, and softens any scar tissue that is usually present in an injured area. All taping methods are used as an adjunct to therapy and exercise. Kinesio taping is a rehabilitative taping technique that is designed to facilitate the body's natural healing process while providing support and stability to muscles and joints without restricting the body's range of motion as well as providing extended soft tissue manipulation to prolong the benefits of manual therapy administered within the chiropractic office. Functional taping is used to facilitate range of motion and proper biomechanics of the joint, to stimulate muscle and joint proprioception, prevent over-contraction of the muscle, assist and give support, while improving patients tolerance to exercise and movement. Athletic taping is mainly used for support and limiting range of motion, to assist in decreasing pain and swelling and help prevent further injury. Dr. Forstie will recommend different stretches and exercises at the different stages of recovery that will help you not only strengthen and correct the problem, but also enhance your performance and prevent or limit future recurrence of the condition. Posture good or bad can affect the way we look, feel, and move. 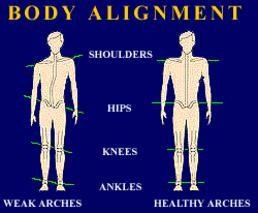 Over time or when the body is put under stress, poor posture may result in pain and injury. Practicing proper biomechanics can help prevent or reduce many muscular problems, especially those associated with the back and neck. Practicing a good stance and posture has been proven to improve athleticism and strength, improve oxygen delivery, reduce allergies, improve sleep patterns, reduce anxiety, increase confidence, and decrease the risk of injury. Foot problems can affect the rest of your body and how you feel. In fact, chronic low back pain is often the result of faulty foot biomechanics, and stiff necks can be caused by problems in the feet. With orthotic support, low back pain, hip pain, knee pain and foot pain all resolve as proper function is returned to the feet and the walking process is corrected. Sprained ankles also become a thing of the past with the proper support provided by orthotics. The causes of foot problems can include low arches, no arches and over-pronation (excessive turning in of the foot while walking). If there is a biomechanical dysfunction stemming from your feet, orthotic support can help. This addresses the assessment, treatment and management of soft tissue injury. Injuries from acute trauma or repetitive strains can cause pain and dysfunction primarily of the neuromusculoskeletal system. This form of therapy involves soft tissue mobilization and massage, active and passive forms of muscle stretching; increases blood circulation, helps eliminate the build up of scar tissue, trigger points, and anything in the muscle limiting its ability to properly function. The adjustment is to restore joint mobility by manually applying a controlled force into joints that have become hypomobile, or restricted in their movement as a result of a tissue injury or long term stress. These hypomobile joints in the spine are called subluxations and if not corrected, they can lead to inflammation, muscle spasm and irritation of the sensitive nerve tissue exiting the spinal cord and passing through the vertebrae. 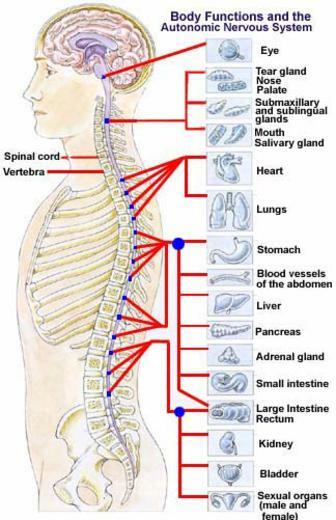 A subluxation can interfere with the proper functioning of the nervous system, which is the master system that controls and coordinates all the function within the body (see illustration on left). When these subluxations in the spine are removed by a chiropractic adjustment, there is improvement in posture, muscles, ligaments, discs and overall health. There is better communication with the nerve system to every cell, tissue and organ of the body. All systems within the body can achieve overall improvement in function. In order to enhance your return to optimal health, Dr. Forstie will provide specific recommendations on nutritional supplements and healthy food choices, based on your individual needs. Micronutrient and genetic testing also available to assess specific nutritional needs. The Pilot Diode Laser is used on muscles and joints. From knuckles to knees and hips to hands, the Pilot Diode Laser reduces the pain, inflammation and soreness anywhere on the body and speeds up the healing process. 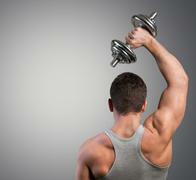 Sports Injuries, sprains, muscle tear and reconstructive surgery. More joint, muscle, circulatory and inflammatory conditions.